Cook the onions in a butter skillet for 3 minutes remove from heat. Stir in cracker crumbs, chicken and 1 Tablespoon of Parmesan, wine and seasoning. 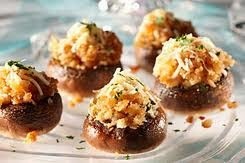 Spoon into mushroom caps, place on a baking sheet.